Electra and Red Electra Moscatos are our most popular wines and are made in the light, spritzy, unfortified Moscato d’Asti style. They are refreshing anytime, perfect for brunches, BBQs, and paired with your favorite savory or sweet foods. Our winemakers blend Orange and Black Muscat along with Muscat Canelli to create Moscato that is crisp and full of fresh, ripe fruit. 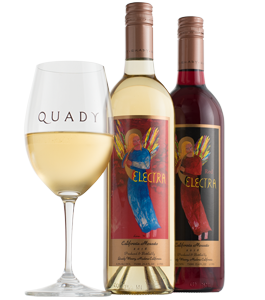 Fans call Electra The Smile Wine because of the smiles that inevitably appear upon first sip. We celebrate the finest quality muscat grapes in single varietal bottlings of fortified Orange and Black Muscat dessert wines. The varieties we use are rare, delicious expressions of the fruit filled San Joaquin Valley. The winemaking style is aromatic, full-bodied and perfectly balanced to finish clean, not cloying. These are the wines that solidified Andrew Quady as a sweet wine specialist. Our dessert wines are fortified to 15% alcohol. 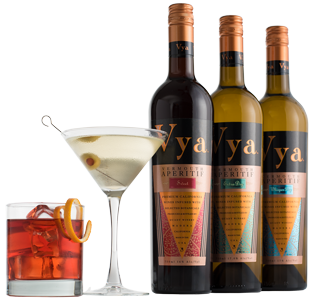 Vya was created with the idea that vermouth could be enjoyed similarly to other wines: by swirling it in the glass, smelling the aromatics, and enjoying the subtle flavors. 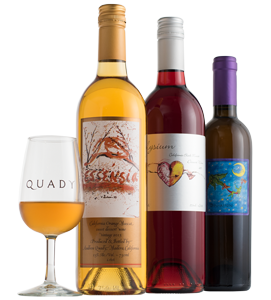 It is lovingly hand-infused in small batches at Quady Winery with over seventeen different herbs. Vya makes an elegant aperitif by itself and brings forth new dimensions in cocktails. Read more about the Vya story. If you like port you will love our Starboard. Starboard is made using traditional Portuguese grape varieties grown in the foothills of Amador County. 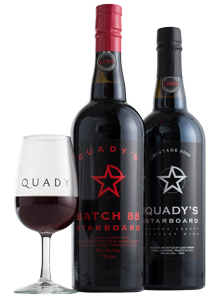 Starboard has the bright fruit of ruby style port and the round nutty character of tawny port. This is due to our distinctive climate and soils, which resemble those of Portugal. Out of deference for the fine tradition that all port must come from the Douro in Portugal, our ports are named Starboard, nautically on the right of the boat from port. If you enjoy amontillado sherry, you should try our Palomino Fino. 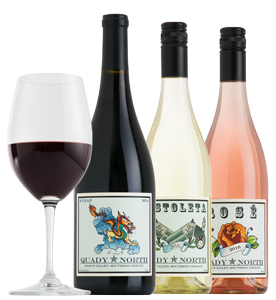 Nutty, buttery, complex, this is possibly the only amontillado style sherry made in the U.S.
Quady North Winery began in 2005 when the Quady family planted Rhone varieties in the Applegate Valley of Southern Oregon. Herb Quady, winemaker, and son of Andrew and Laurel Quady, has turned this succession of the Quady name into an award winning winery showcasing small lot, expressive, vineyard select Viognier, Cabernet Franc, Syrah, and Rhone blends sourced from his estate vineyard and other carefully selected Southern Oregon vineyards.